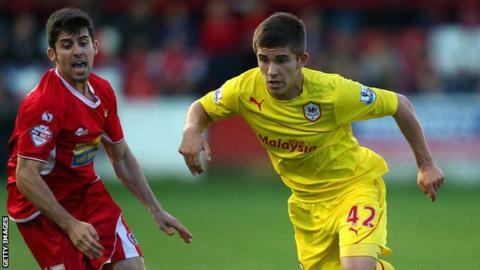 Cardiff City and Wales defender Declan John has signed a new long term contract at the club. The 18-year-old from Merthyr played for the Bluebirds in their opening Premier League match at West Ham in August. He made his Wales debut two months later in the World Cup Qualifier win against Macedonia. "He's another one of the young talents we want to make sure that we've got here long term," said Cardiff manager Malky Mackay. "It's a long-term strategy with Declan it's about making sure that we nurture him in the best way so we don't see some sort of burn out. "He's had a little taster of first team action and he's had a little taster of international action which is superb for the football club and for him and the work that our coaches have done with him. "They should be proud of the progress he's made and there's plenty still to come."